Keep your bag, clubs and accessories protected with a heavy-duty travel cover from Palanka. A true gentleman's game, golf offers more than just competition against fellow golfers; it's pits us against ourselves each time we hit the course. And while some sports may stop due to a little weather, in golf we just play through and enjoy the outcome. That's why we created a heavy duty golf bag cover that protects your bag, balls, tees and accessories so you can focus on improving your game and not thinking about your gear in the middle of your backswing. Crafted with premium 600D polyester, our premium golf bag covers keep your bag safe and offers superior functionality. A thick, padded top protects your clubs from weather or dings while traveling, two additional pockets let you store even more equipment, and built-in wheels make it easier to pull alongside you instead of carrying it over the shoulder. 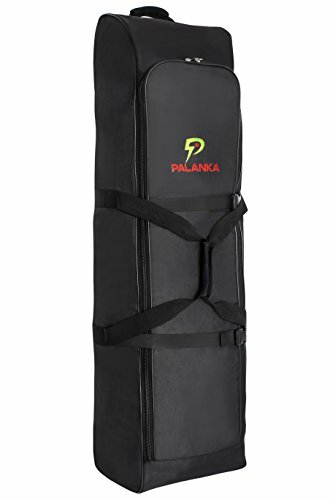 Perfect for the long game, get a Palanka Travel Golf Bag today and start focusing on the game-not your gear. Click 'Add to Cart' to get a premium golf bag cover to protect your bag, clubs and accessories while you're on the course or traveling around the world. Premium Travel Protection - Crafted with a resistant material, our golf bag covers keep your bag dry and your clubs, balls, tees and accessories safe. Accessible Pockets - Each golf bag cover comes with two inside zippered pockets to store extra golf gear, keys, wallets or scorecards. Convenient Wheels - The base of each golf bag cover features two "skate" wheels that make it easier to roll your bag through an airport, course, or to the car. Enhanced Durability - Palanka golf bag covers are made with 600D polyester with ultra-strong, lockable zippers and a protective no-rip top handle. 100% SATISFACTION GUARANTEED - Every Palanka travel golf bag protector is backed by superior craftmanship, reliability and a true satisfaction guarantee. If you have any questions about this product by PALANKA, contact us by completing and submitting the form below. If you are looking for a specif part number, please include it with your message.